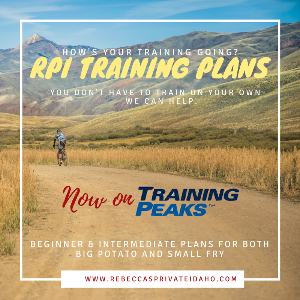 Rebecca Rusch has created the Rebecca's Private Idaho training plans with her coach Dean Golich to help riders prepare for her namesake race, Rebecca's Private Idaho or any 50 or 100 mile gravel grinder. Rebecca Rusch is the Queen of Pain with a heart of gold. It doesn’t matter if Rebecca is pedaling through the night on an epic adventure across Italy, riding her bike up Africa’s legendary Mt. Kilimanjaro, or teaching at a #JoinTheRusch camp or clinic, she brings energy, positivity and inspiration to whatever challenge she meets. As a professional athlete for over three decades, the 7x World Champion has continually tested her own limits, and shattered the glass ceiling in whatever sport she tackles. She redefined the team dynamics of adventure racing, has a first female ascent rock climbing El Capitan in Yosemite, river boarded down the Grand Canyon, and has given the men a run for their money in endurance mountain biking. Rebecca’s work extends far beyond the start line as the best selling author of Rusch to Glory, event producer for Rebecca’s Private Idaho, motivational speaker, firefighter, and cycling advocate. Additionally, she has raised over $100k for bike related charities through her adventures and events. Through Red Bull Media House in 2017, Rebecca released a full length feature film, Blood Road , which followed her very personal journey along the 1,800 kilometer Ho Chi Minh trail. For 2018, Rusch’s calendar includes Rusch Academy camps, expeditions and record breaking rides, as well as adventures to bring awareness to historic trails and national monuments, such as the Lewis and Clark trail and Bears Ear national monument. Success. Coach Rebeccas Private Idaho has been notified of your message.